Following a year of insightful and exciting conferences spread across Eastern Europe, SHARE Architects continues its mission to bring excellence in architecture with the 20th edition of SHARE in Bucharest, Romania. Join us on April 18, at Radisson Blu Hotel for a full day of interactive talks on all things architecture-related. It’s time to put creative ideas in the right context. At SHARE Bucharest you’ll have the opportunity to learn, interact with like-minded people, and find inspiration for your next big project. 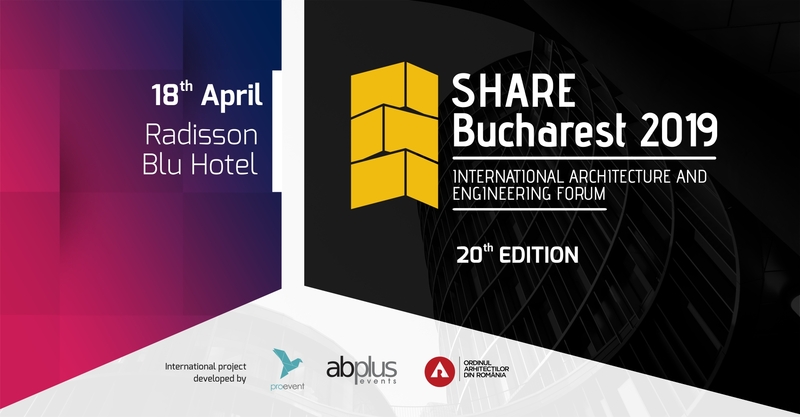 SHARE Bucharest 2019, International Architecture and Engineering Forum will take place at the Radisson Blu Hotel and will gather over 350 architects, landscape architects, designers, lighting designers, engineers, urbanists, real estate developers and from public institutions, architecture, and design students, companies with innovative solutions in the construction field, other professionals related to architecture field. The International Architecture and Engineering Forum is organized by PROEVENT Cultural Association and the Romanian Order of Architects. Mr. Arch. Alexandru GĂVOZDEA, OAR President, will lead the forum conference. The 20th edition of SHARE Bucharest will have 3 panels: Official Plenary Session, Facades, and Special Guest Presentation. Special Guest Wolf D. Prix, Co-founder Design Principal and CEO at COOP HIMMELB(L)AU, will hold a special presentation and debate. We invite you to meet our speakers and register for SHARE Bucharest 2019! Wolf D. Prix is counted among the originators of the deconstructivist architecture movement. COOP HIMMELB(L)AU had its international breakthrough with the invitation to the exhibition “Deconstructivist Architecture” at MoMA New York in 1988. Over the years Wolf D. Prix/ COOP HIMMELB(L)AU was awarded with numerous international architecture awards. The exhibition at the Museum of Modern Arts’, curated by Philip Johnson, also included the firm COOP HIMMELB(L)AU, led by the architect Wolf D. Prix amongst Peter Eisenman, Frank Gehry, Zaha Hadid, Rem Koolhaas, Daniel Libeskind, Bernard Tschumi. They would prove to be some of the most influential architects of the late 20th Century to the present day. Christos has worked at ZHA as a Senior Designer since February 1998 and has subsequently worked as Project Director on numerous projects and winning competitions. Christos gained his BArch (Hons) degree as a Fulbright Scholar at the Pratt Institute’s School of Architecture in Brooklyn, NY in 1995. He received his Graduate Design Diploma in 1998 in Advanced Architectural Design at the Architectural Association, London. He teaches Parametric Design and Urbanism at the Architectural Association in London and is Guest DAAD Professor in the Dessau Institute of Architecture (HA) at Bauhaus, Dessau. He is at the forefront of design research and often participates in design juries at universities around the UK. Jan Knikker (Bad Soden Ts 1972) joined MVRDV in 2008. Before this, he started his career as a journalist, and then shaped the public image of OMA for nearly a decade. As Partner at MVRDV, Jan leads the Contracts, Business Development and Public Relations efforts, forming a client-oriented, fast, and strategic studio that includes a strong visualisation team and the practice’s sustainability team. He leads MVRDV’s branding efforts and has overseen the practice’s rapid expansion into new markets, focusing on solutions for global issues through its architecture and urbanism. He has worked on many publications and exhibitions, including the book MVRDV Buildings. Jan regularly lectures internationally, at commercial and academic venues in Germany (Polis Convention, Stiftung Baukultur), the UK (RIBA), Israel (CTBUH), Colombia (Universidad Nacional, Utadeo), Australia (RMIT), Kuala Lumpur (UCSI), and elsewhere. He writes for various publications and is Deputy Editor of Domus 2019. He is a member of the HNI Heritage Network, led the online design magazine Dafne, and from 2007 to 2011 was a member of the International Projects commission of the Netherlands Architecture Funds. Fernando Menis is an architect, PhD in Architecture, Associated Professor at the University of Hong Kong (HKU), the European University of Canarias (UEC) and Chairman of the Laboratory for Innovation in Architecture, Design and Advanced Tourism of Tenerife. Member of Jury, Workshop Director and Guest Lecturer at Harvard, Columbia NY, ESA Paris, TU Berlin Universities, Akbield Wien Academy and at Architecture Congresses in Switzerland, Australia, India, Singapore, Taiwan, China, South Africa, Croatia, Italy, Poland, Colombia, Mexico and so on. Having completed his studies of Architecture in Barcelona, between 1981 – 2004, he creates projects at the firm he founded with his two partners. He later started an independent path through two architectural studios — Menis Arquitectos and Fernando Menis — with headquarters in Tenerife and Valencia. Menis serves as principal architect and/or co-author of a large number of projects. Some of the ready-built projects are: CKK “Jordanki” in Torun, Poland (2015), Burchen Public Square in Burchen, Switzerland (2015), Insular Athletics Stadium (2007), Magma Art & Congress (2005), Swimming pool on Spree River in Berlin (2004) and Presidency of the Canary Islands Government Building (1999). Some of the on-going projects are: Urban / Coastal Seaside Planning in Boa Vista — Santa Monica and Chave (Cabo Verde), Three Villas in Lijiang, China, Auditorium in Pajara, Agora Garden and Aurum House in Taiwan, the Holy Redeemed Church in Tenerife, and the Burchen Mystik Hotel in Burchen, Switzerland. As an architect, Șerban is always interested in the evolution of architecture towards a better future. He strongly believes in its power to change the world if architecture becomes part of the general awareness of everybody. He was rewarded with the Medal Bene Merenti, offered by the University of Architecture an Urbanism Ion Mincu Bucharest for merits in representing the profession of architect, the Medal of Excellence offered by the Media Association and the Toffee offered for the entire activity of his practice, by Bursa Construcțiilor. As a practitioner, Șerban is working as managing partner of Dico and Țigănaș architecture and engineering. Several awards are rewarding the projects elaborated through the over 20 years: Architizer A+, The Medal of the President of UAR, BNAB, 1 st Prize BATRA, 2 nominations at Mies van der Rohe European Union Awards, a nomination for Building of the Year, by Arch Daily. Being a professor for future architects is a drug and a duty. Șerban teaches that the most important design of every young student is how to become an architect. He promotes the culture of architectural design competitions and has generated several successful such endeavors, both for students and professionals. Șerban considers part of an architect career the contribution to the professional organizations for the advance of architecture. He has served as president of OAR, board member of ACE, Council member of UIA and he currently is Secretary General of UIA. Vardastudio is located in Paphos and was established by Andreas Vardas in 1997. Andreas Vardas graduated from the Bartlett School of Architecture, UCL, in 1993 and gained his working experience in London. He is a member of the RIBA, as well as ETEK. The studio’s work includes a number of individual houses, housing development as well as public buildings and a healthy number of competitions. The practice has earned many awards in competitions as well as the Republic of Cyprus President’s award. It has also represented Cyprus in the European Mies Van Der Rohe award. The studio’s design agenda is focused on two points: a clear architectural response to the site and the client’s brief, and simplicity in form. Each project is tackled in a unique way, and becomes a direct response to its environmental conditions, an integral part of the landscape. Built and natural environment must interact as closely as possible to provide the best spatial experience to the end user. The built form is simple and functional, with different functional elements expressed and accentuated. Detailing is kept simple and beautiful. Ornamentation has no place in the design process. Instead, materials are used in imaginative ways to provide texture and atmosphere. Graduated from Cape Town University in South Africa. Established his own office in Athens in 1961. Works comprise several large scale projects in Greece and the Middle East, including public buildings, auditoria, hospitals, rehabilitation centers, landscaping, and urban design. Numerous awards in competitions. Two of the 30 Ministry of Public Works ex-aequo prizes for the best-implemented buildings in Greece and one of 9 ex-aequo awards for innovative housing. Has participated in several activities of the International Union of Architects and was its President between 1999 – 2002. The triennial “Vassilis Sgoutas Prize” was launched by the UIA in 2007. Honorary Member of the architects’ institutes of Australia, China, Japan, Kazakhstan, Korea, Mexico, Panama, Philippines, Russia, South Africa, USA and Foreign Member of the State Russian Academy of Architecture and Construction Sciences. Has been awarded the medal of the Magnesia Chapter of the Technical Chamber of Greece for his “lifelong contribution to architecture”. Alfonso Femia was born in Taurianova, Reggio Calabria (IT) on December 1966, the 7th. He graduated from the University of Genoa – School of Architecture in 1992. Register of Architects of Genoa (IT) since 1994. Register of Architects of Île-de-France (FR) since 1995. Register of Architects of Switzerland since 2014. Alfonso Femia has been a teacher of Architectural Design Didactics at Kent State University in Florence and at the Universities of Genoa and Ferrara – Schools of Architecture. In 2015, he created 500×100 and 500x100Talk, the city as a dialogue tool. He uses the SetTalk format in Milan and the City Talk in the main European and Mediterranean cities so that the city becomes a dialogue tool, a place of meetings and exchanges on the theme of the city itself. Atelier(s) Femia developed the masterplan of the Val d’Europe area for the candidacy of Paris at the World Exposition 2025. He won the competition for the construction of a cinema with a sports and leisure centre in La Ciotat. Mark Hemel is a Dutch architect and designer, and co-founder (with Barbara Kuit) of the Amsterdam-based architectural practice Information Based Architecture (IBA). He is best known as the (co) architect of the Canton Tower in Guangzhou. Hemel was educated by American theorist Jeffrey Kipniss and UK architect Zaha Hadid as well as Dutch architects Herman Herzberger and Carel Weeber. He was particularly influenced by books of Richard Dawkins (The Selfish Gene 1976) Kevin Kelly (Out of Control 1995), Ilya Prigogine (Order Out of Chaos 1984) and Douglas Hofstadter (Gödel, Escher, Bach). After his post-graduate studies at the Architectural Association in London Mark began teaching at the AA. Besides an interested in everything that evolved or subconsciously developed, Mark also has a great interest in mathematics and geometry. During his studies in Delft, he pursued mathematical courses in chaos theory. The reason for his interest in this is that chaos theory seems to explain why Modernism, in its purest form, is doomed to lead to disaster and that the alternative “synthesis and integration” bears much more prospect. Hemel was chosen as one of Design-Build Network’s “New Young Architects to Watch for 2010”. Hemel’s work has been published and exhibited widely. In 2002 he was shortlisted for the Young Architects of the Year Award in the United Kingdom. He had received support by the Dutch Department of Trade and Industry and received several encouragement-grants by the Netherlands Foundation for Visual Arts, Design and Architecture. Hemel is the author of a book entitled Supermodel, the making of the world’s tallest TV tower (2011).